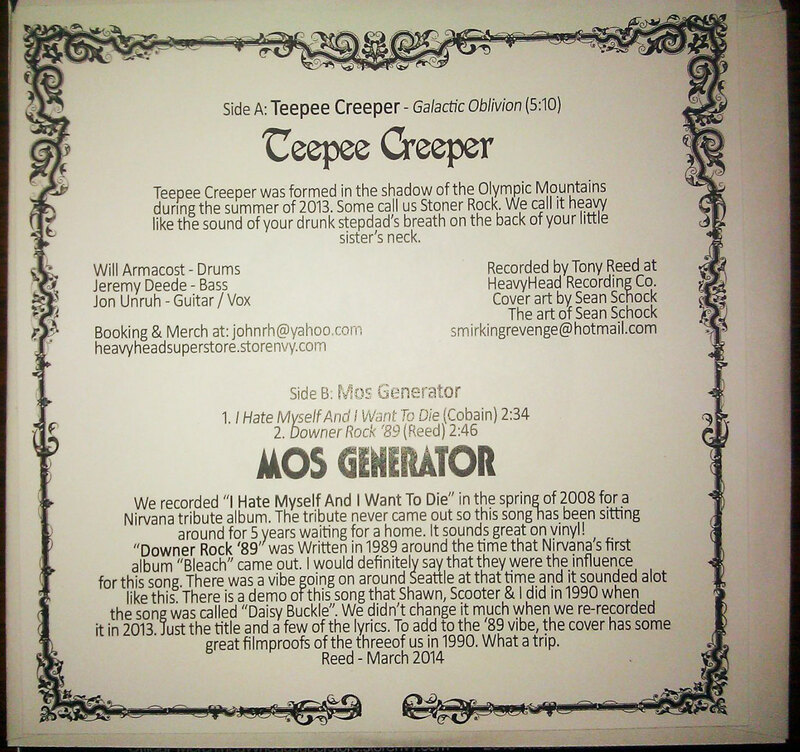 ON WAX: Mos Generator / Teepee Creeper Split 7"
« Doom in June Vol. 4 Fest Launches Tonight! The blend will ring familiar to heavy riff heads, and Reed‘s production preserves a natural vibe that suits the three-piece well, guitarist/vocalist Jon Unruh‘s double-tracked voice switching from a gutty verse delivery to a cleaner chorus and back fluidly over Jeremy Deede‘s bass and Will Armacost‘s drums. A “sky god” is liberally invoked throughout the five-minute push, but there’s a sense of build within the song as well and if you told me two years from now that this split was Teepee Creeper‘s launch point for a solid string of output, I’d believe it. 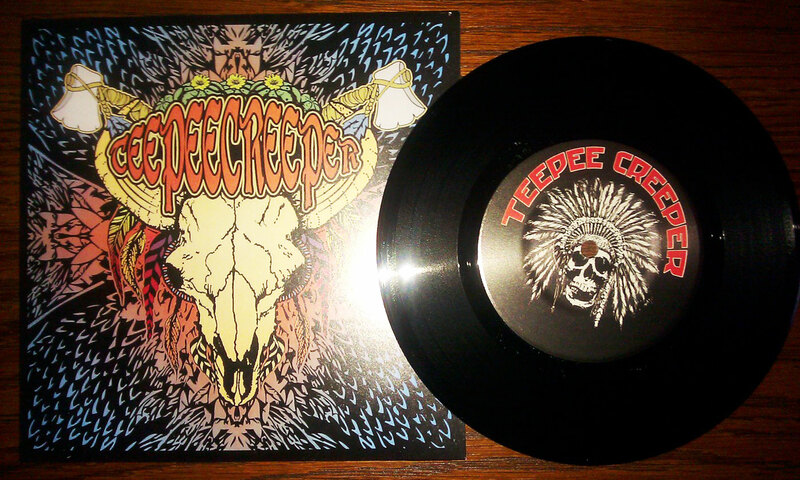 Between Unruh, Deede and Armacost, Teepee Creeper is nobody’s first band, and accordingly, they sound like they know what they want to do and are setting about making that happen. saved for the recently-undertaken Heavy Home Grown release series — but it’s easy to hear the stylistic hallmarks of that era, however much of Mos Generator‘s modern persona factors in alongside. 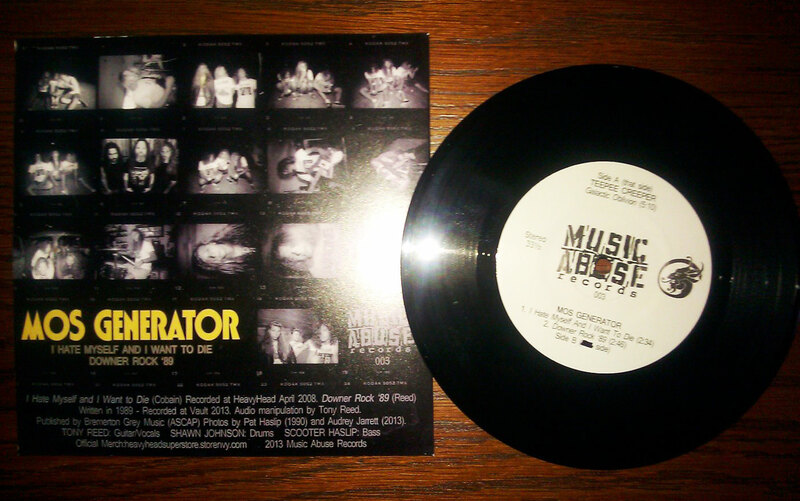 As an introduction to Teepee Creeper and a fan piece for Mos Generator, the split — out through Music Abuse Records — gets a surprising amount done in its just-over-10-minute runtime. Art on the sleeve by Sean Schock for the A-side, a few vintage Mos Generator pics on back and the aforementioned liner round out the package, and while it’s a quick release, it’s also one you might wind up flipping back and forth a few times in a row to get a feel for how the two bands work together. Not to spoil it, but they work pretty well. This entry was posted	on Friday, June 6th, 2014 at 4:43 pm	and is filed under On Wax. You can follow any responses to this entry through the RSS 2.0 feed. You can leave a response, or trackback from your own site. Thank you for the review, I feel you hit it spot on! We actually started this project last summer and this was the 1st song we put together and took straight to Tony to put on 7″, we are heading into the studio sometime this summer and will hopefully have at least 6 songs done by late summer/early fall. We look forward to working with Mr. Reed and will send you the new material.